What are Broccoli Sprouts and Why Are We Talking About Them? Broccoli Sprouts are literally sprouted broccoli seeds. They’re little, but it appears that they pack a HUGE punch when it comes to health benefits. We first heard about this phenomena while listening to the Joe Rogan Experience podcast with one of his guests, Dr. Rhonda Patrick. There has been a ton of research on the benefits of these little gems, and we intended to figure some of this out so we could get in on the goodness. If that’s not enough to get you to keep reading, I don’t know what is. Guess what else? They’re super easy to grow all on your own with very limited supplies. 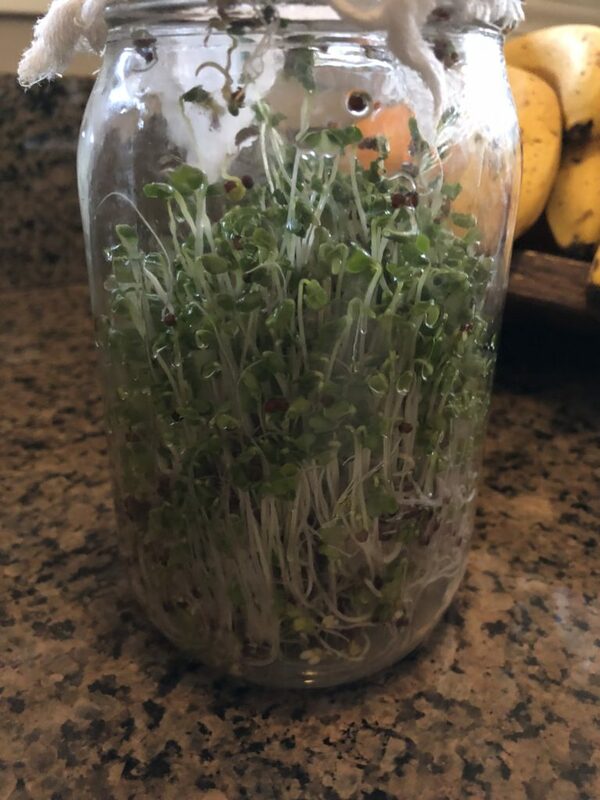 I’ll admit, I’m not much of a green thumb but I’ve been successfully growing broccoli sprouts on my kitchen counter for a while now. We’ll get into those details more in a minute. What do you do with them? You eat them! It’s that simple. We keep some fresh sprouts in a sealed container in the fridge and put them in salads or on a sandwich. There’s additional research that suggests freezing your sprouts has an even more profound effect on the sulforaphane levels, so we keep a big bag in the freezer and use it in smoothies. The big question you probably have is “But, is it working?!?”. My answer would be that I just don’t know. We may never know. There are things you can do to get an idea and hone your health regimen, though. Go to your doctor and request a full blood panel. This will give you a baseline, as well an idea where you need to tweak things. For example, Matt and I were both low in Vitamin D so now take supplements. If your blood sugar is high, take a look at your diet and find ways to cut out sugar, simple carbohydrates, and processed foods (there’s usually tons of hidden sugar in processed foods). Like I said, we may never know the benefits of eating clean, healthy foods, but I definitely know it’s not doing my body any harm. Also, while I’m on this adventure, spinning around the sun, I want to feel as good as I possibly can, and that includes feeding my body REAL food and nutrients. – After the intial soaking, rinse the seed well and drain out all the water 1-2 times a day. – Watch your babies grow! Give it a shot, I dare ya! But if you do, you have to let us know how it goes. Cheers! Very cool!!! Thanks for the info! There’s another local company too — Gracious Greens. They sell at several farmers markets, including Atascadero, and at the SLO Natural Food Coop. Oh, thank you!!! We’ll look for them! Help! I used to grow these, but now for some reason they won’t grow. I’ve been soaking my cloths in vinegar water, could this be the problem? Or is it that I put them in a slightly brighter spot? I can’t find on the internet if they need an alkaline or acidic environment in which to grow. They grow for a few days, then stop. Hi there! I don’t soak my cheesecloth in anything. I just put some amount of seeds in a mason jar and soak for 12 hours, then drain and rinse every morning. Ours sit near a window, not too much sun. Try that and let me know how it goes. Good luck!